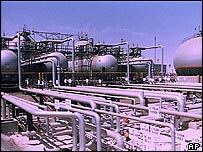 Saudi Arabia has called for a modest increase in oil supplies to cope with the extra demand expected in 2005. The comments came ahead of a meeting of the Organisation of the Petroleum Exporting Countries on Wednesday. Saudi oil minister Ali al-Naimi, said Opec should increase supplies by 2% or 500,000 barrels per day (bpd) to 27.5 million bpd. His statement led US oil prices- currently at $54.06 a barrel - to fall by 50 cents. Kuwait agreed with the Saudi statement, but Iran said it was opposed to increasing oil supplies. Mr Naimi, who seldom gives a steer on future Saudi oil policy, said: "To adequately fulfil this year's additional demand, Saudi Arabian output shall be increased from current levels at a later time this year." However, he said supply could be increased immediately by tapping into the country's spare capacity of two million bpd. Analysts said Saudi Arabia could be announcing its intentions to discourage speculative buying of oil, which tends to force prices even higher. Much of the extra demand for oil is coming from China. Even Iran, which is against the supply increase, said Opec felt "pressurised" with prices more than $50 a barrel. At this level, the nations that buy from Opec are worried that high prices will depress the world economy. Their leaders are therefore putting pressure on Opec to increase supply.